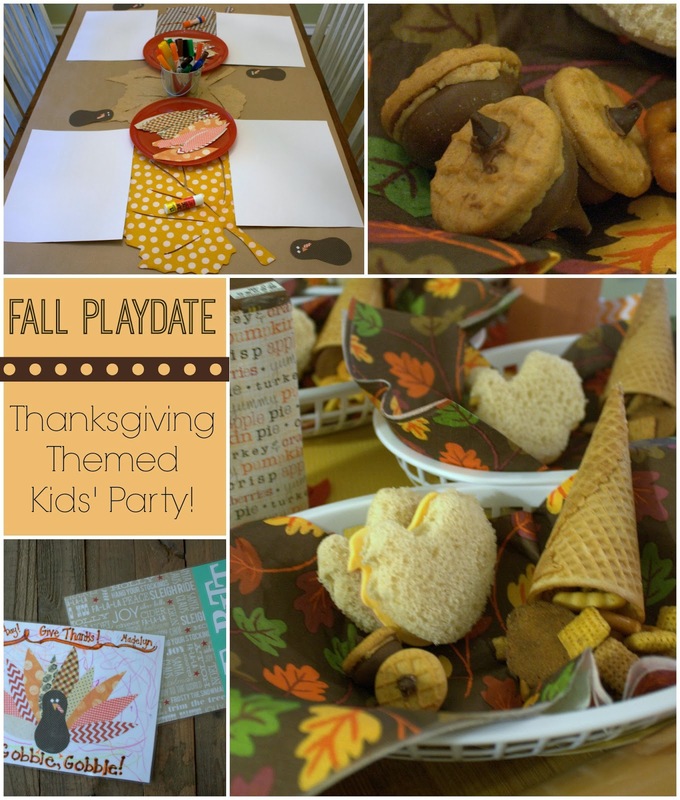 Last week, I hosted a little Thanksgiving themed Fall playdate for my daughter and a few of her friends. I love having excuses to plan little parties for my cutie! One day, she won't enjoy themed lunches as much as she does now. My mission is to soak in these preschool days as much as possible...and enjoy this fleeting season! Because? Fleeting, it is! I kept things fairly simple (honestly, I did!). In fact, I was able to prepare all the food the night before, which made party day a total breeze. For the sandwiches, I used a turkey-shaped cookie cutter and cut out bread, cheese and deli meat. The meat and cheese stored in a tupperware and the bread I stored in a ziplock. At lunch, I just grabbed and assembled. 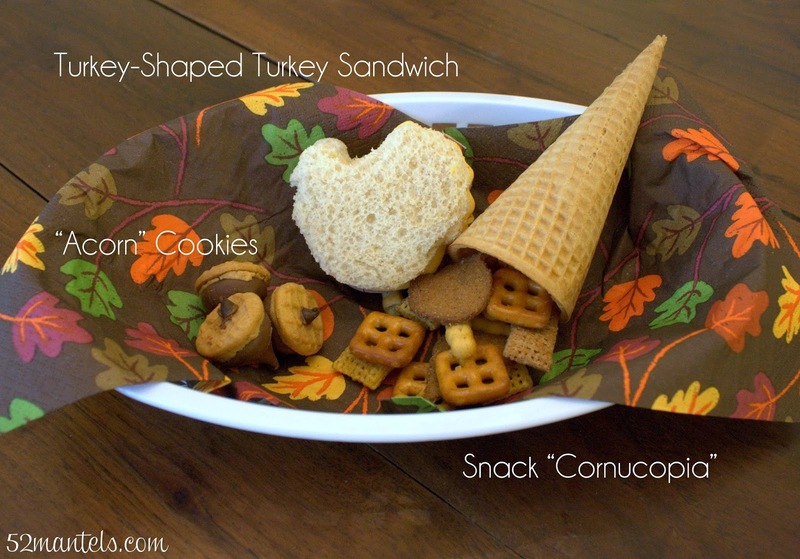 The snack cornucopia is cute, don't you think? It's just a waffle cone filled with Chex mix. How easy is that? 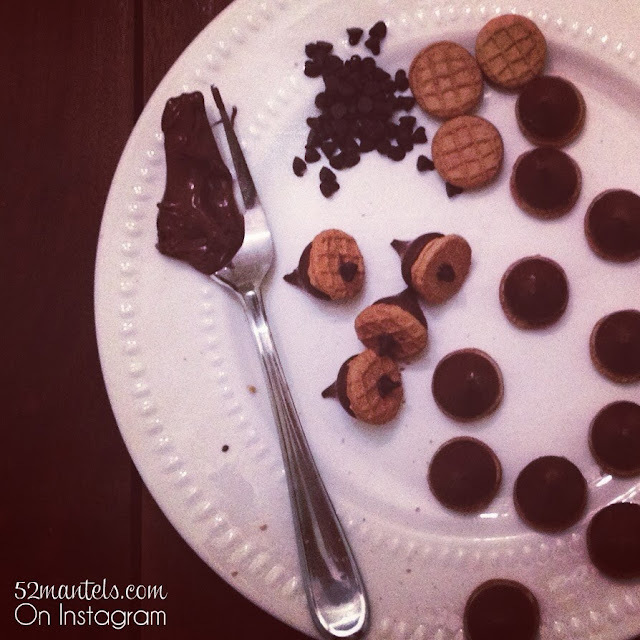 I shared the these cute acorn cookies on Instagram, which were inspired by While He Was Napping. Another easy food idea! And, might I add, tasty. I changed the recipe up a bit by using nutella as the "glue". 4 ingredients and about 10 minutes later, I had a whole batch of these cute cookies! After the party, I decorated the backside of each placemat with Christmasy scrapbook paper and each child's name, cut out of white card stock. Then I took them to kinkos and used their self-serve laminator. The price per large (11x17) lamination sheet is $3.99 at kinkos. Happy Wednesday! Come back tonight for our weekly link party. And, don't forget to enter to win THREE custom Santa Sacks. Only a few hours left to enter! Like what you see? Follow 52 Mantels! I link up here and here! Adorable party! 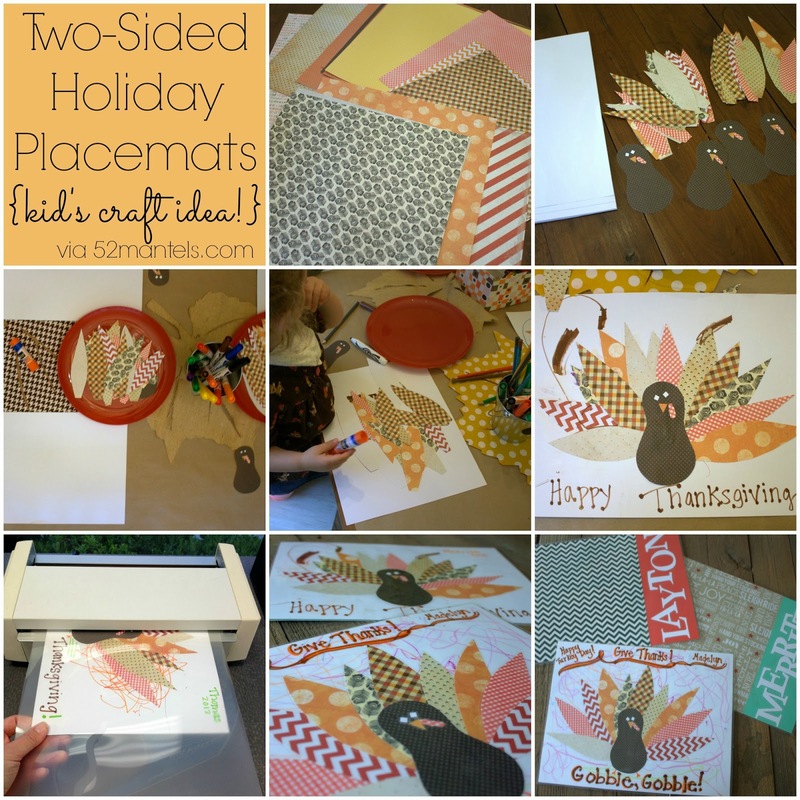 Love the turkey sandwiches and acorn cookies. So cute! 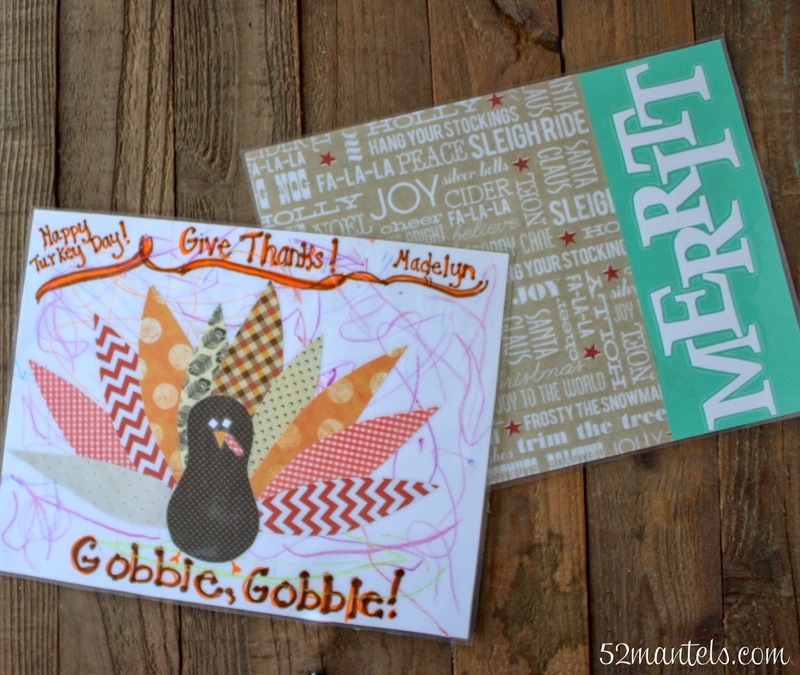 I'm putting together a Thanksgiving Feast for my Girl Scout troop. Until I saw your post, I was focused on the food and forgot about the plates and napkins. It is a time consuming process to locate a legitimate, high-quality designer Michael Kors Handbags On Sale at a decent price. One brand name that is sought after is the Michael Kors Bags On Sale. Anywhere you see high demand you will find people out to make a quick buck. على تنظيف جميع الغرف والمطابخ والحمامات التي توجد في البيوت. العديد من المساحيق التي تعمل على إزالة البقع نهائياً. مساحيق خاصة لأزالة بقايا الطعام من المطابخ وخاصة السيراميك فالمطبخ لابد من تنظيفه جيداً وعدم أهماله حتى لا تتراكم الدهون والشحوم، كما أن المطبخ لابد من تعقيمه وترتيبه بأستمرار حتى لا يراكم الحشرات الزاحفة والطائرة وتعمل على تلوث الطعام وإصابة الإنسان بالأمراض. Hi! I'm Emily. Wanna know more? Click my photo! All content and pictures originating at this domain are property of 52mantels.com/Emily Morgenstern. Please do not alter or publish without properly crediting their source. Periodically I am paid to review products and/or services. Any such endorsement will be clearly identified in the body of the review. Sometimes I just like a product and can't wait to tell you about it. No mention of a disclosure? Then I have no affiliation with the product other than happy customer. I will always be 100% honest in my assessment of a product/service, whether officially endorsing, or not. All opinions are mine and mine alone. Emily Morgenstern/52mantels.com. Powered by Blogger.